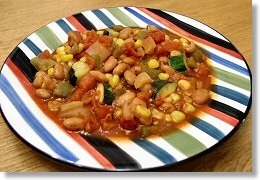 Here’s a delicious, fast chili suitable for the Fuhrman program. You can omit the corn completely and just use more zucchini if you’re trying to cut out grains. This is thick enough to serve as a filling for burritos. In a non-stick pan over medium heat, sauté the onion, bell pepper and garlic just until lightly browned, about 3 minutes. Add the beans, tomatoes, and seasonings. Bring to a boil, then reduce heat, and simmer uncovered for about 10 minutes. Stir in the corn and zucchini and continue to cook until the zucchini is just tender, not mushy, about 7 minutes. Loosely based on a recipe in Lorna Sass’ Short-Cut Vegetarian: Great Taste in No Time by Lorna Sass. Made this recipe but put it in a crock pot on low and let it cook for about 10 hours while I was at work. Came home and dinner was ready to sit down and eat. Using the tomatoes with chilis (1 can) without the chili powder was just the right spiceness. Used a red pepper instead of a green pepper and it was quite delicious. This recipe is delicious! Thank you! I made the most awesome salad and I found the recipe on Oh She Glows web-site. It was called Back on Track Wheatberry and Bean Salad. I used 1 cups of black beans and 1 cup of chickpeas and did not use any oil in the dressing. However I did add a small side of avocado pear while eating the refreshing salad. I shared with 2 non-pant only eaters at work and they raved about it and both wanted copies of the recipe. Very healthy and flavorful salad. Yum !! My latest dish has been such a great, easy, cheap and very healthy “convenience” food: at the bulk section at my Whole Foods there is a 32 bean-and-vegetable soup mix. I mean this soup has all kinds of heirloom beans and grains that I have never heard of! I boiled it with some veggie stock (1.99 whole foods brand) stuck a sheet of seaweed In it (optional!) and adding canned crushed tomatoes towards the end. It’s simply perfect and serves many health needs!